I always get too excited when something new from The Script is showcased online. It feels like meeting a new book in the bookstore -- well at least that's a great feeling for me. And now the band has released the music video from their absolutely beautiful song, Man on a Wire. 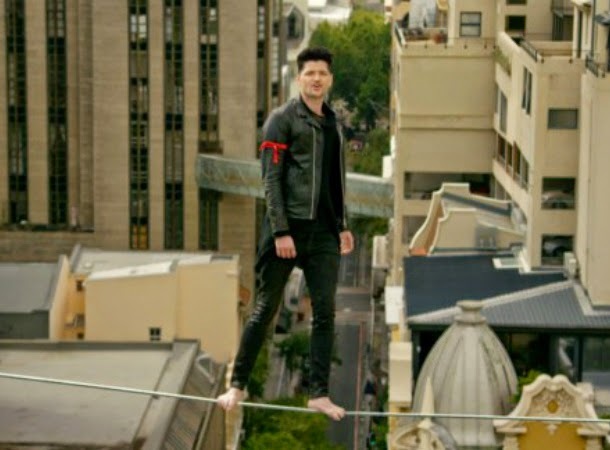 The music video goes literal as it could get, with the band's lead singer, Danny O’Donoghue, performing balancing acts as the song of the title suggests. His bandmates, Mark Sheehan and Glen Power, are doing some gravity-defying performances as well. Such a dangerous game it is, but of course it's only in the music video, where we could assume (and hope) he had some invisible harness on when shooting the video. Feel the danger... love the video... and live the heart-wrenching feeling of the song. Watch the new music video of Man on a Wire by The Script. Although I have so say this concept is not quite new, it is still as gratifying as ever. Here is one from Thomas Dybdahl's Man on a Wire that is almost as similar. Man on a Wire is the third track from The Script's fourth studio album, No Sound Without Silence. It is the third single to be lifted from said album, which is scheduled for release this year. The music video is said to be "inspired by the documentary on French tightrope walker Philippe Petit," according to Metro. You can read hi interview there, as well.